Obituary for Elizabeth J. (Boban) Hazlinsky | Beatty-Rich Funeral Home, Inc.
Elizabeth J. Hazlinsky, 94, of Irwin, Pa. died Monday March 25, 2019 at her home. She was born April 27, 1924 in Adamsburg, Pa. Daughter of the late Joseph and Mary Kvak Boban. 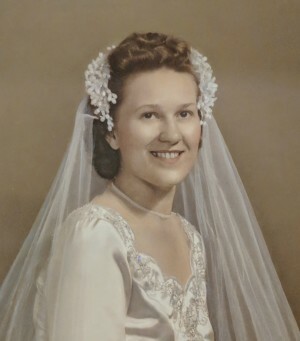 Elizabeth was a faithful member of the St. Edwards Catholic Church in Herminie, Pa. She loved to cook and bake, being known as the Lady Lock Queen for many weddings and parties. She is preceded in death by both parents, husband John Paul Hazlinsky Jr., four brothers – Joseph, John, Vincent and Sylvester Boban, six sisters – Mary Zeoli, Josephine McKoski, Mildred Bennie, Ann Slinkish, Margaret Horid and Augustina Leonard. She is survived by one daughter – Mary Guy and significant-other Herbert Pollitt of Irwin, Pa., four sister-in-laws – Martha R. Hazlinsky of Wyano, Pa., Mary Anderson of MN, Irene Masarik of KT, Joan Murdick of FL. and numerous nieces and nephews. Friends will be received on Wednesday March 27, 2019 from 5:00 pm – 8:00 pm at the Beatty-Rich Funeral Home, Inc. Rt 136 Madison, Pa. Services will be held on Thursday March 28, 2019 at 11:00 am at St. Edwards Catholic Church with Fr. Richard Ulam O.S.B. officiating. Entombment will follow at the Twin Valley Memorial Park in Delmont, Pa. In lieu of flowers, the families request donations to be made to St. Edwards Catholic Church, 120 St. Edwards Ln. Herminie, Pa. 15637. The family would like to thank Renee and Sarah at Redstone Home Hospice for their loving and compassionate care that was provided to Elizabeth. To leave an online condolence, please visit www.beatty-richfuneralhome.com.